CE-JPKF - CATUVELLAUNI - CUNOBELIN, Bronze Unit, c10-20AD. 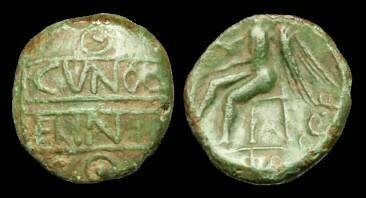 Bronze Unit, c10-20AD, c15mm, c2.2g. Insc. tablet CVNOB ELINI, pellet-in-ring motif ab. & bel./Std, Victory l., hand extended & hldg. a wreath.